The title of this post, is one of my favorite school mottos in Gulu, Uganda. There is something very peculiar yet true about the statement. I often pass the school and have a little giggle to myself and so I decided to use it as the title of this post. I began on Monday by meeting all of the kids around Gulu at their schools to ensure they had a good first day and were properly enrolled. 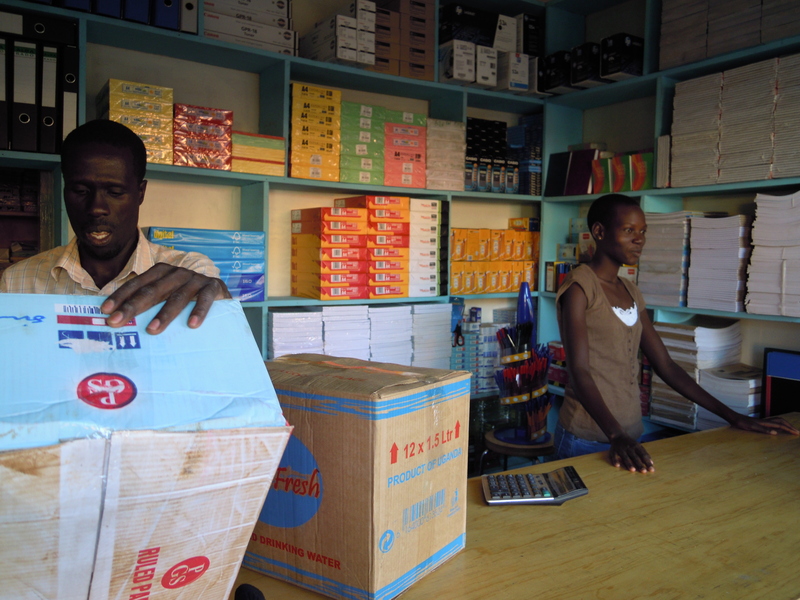 By the end of the week… I had been to each of the schools in Gulu where we have children at least 4 times! It was a long week between registering kids, paying fees, buying supplies, checking with teachers for additional supplies and then delivering them all. Wednesday was the great school supplies shop and took four different trips into town to purchase different parts of the supplies and alot of organization. You can imagine that lugging all this stuff home by motorbike took some organization. Thankfully I had a master shopping list and had been saving boxes for a couple days to pack the school supplies in. The first trip was to buy all of the basic supplies for each child. Each child is receiving a dozen notebooks, pens, pencils, sharpeners and erasers. In addition, if the school requires, they are receiving textbooks, math sets, rulers, hardcover books, drawing books, spring files, razor blades and pencil crayons. Each kid is receiving all the school supplies required by their teachers and in most cases a little extra. The second trip was for backpacks. 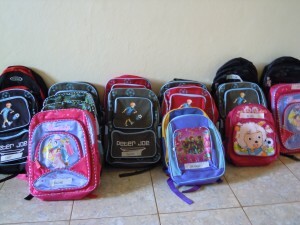 Now this seems simple enough but buying backpacks for 17 kids is a bit of an endeavor. You have to ensure that every backpack is of good quality (zippers and seams), that all kids are receiving equal in terms of design, size and color to avoid jealousy and that they will fit the children properly. In addition, we specifically buy backpacks that are obviously kids bags to ensure that caretakers do not take the bags for themselves. Thankfully there were enough bags with disney princesses, football players and cartoon characters to do the job! After these first two trips, I came home and labelled everything with a sharpie marker. Now I hated when my mother made me do this as a child but since in the end it came in handy when I needed to know who stole my pencil crayons, I made sure to do it for all our kids. So every bag, eraser, pencil sharpener etc has their name on it in black marker so that hopefully no one will steal their stuff… or if they do it can be promptly returned. After labelling it all, I put it all together in their backpacks so that the supplies could be delivered. Now as you saw from the list there were some unique requirements and so the third trip to town was for brooms and toilet paper. These were also the most awkward to get home because they kept falling out of the bag and left wood slivers in my clothes . I waited until Friday to purchase the chairs and cement though, so that I could have it delivered directly to the schools. The last shopping trip was for shoes which was a bit of an experience. We arrived with foot tracings of 13 kids and then had to try and match shoes to the tracings. 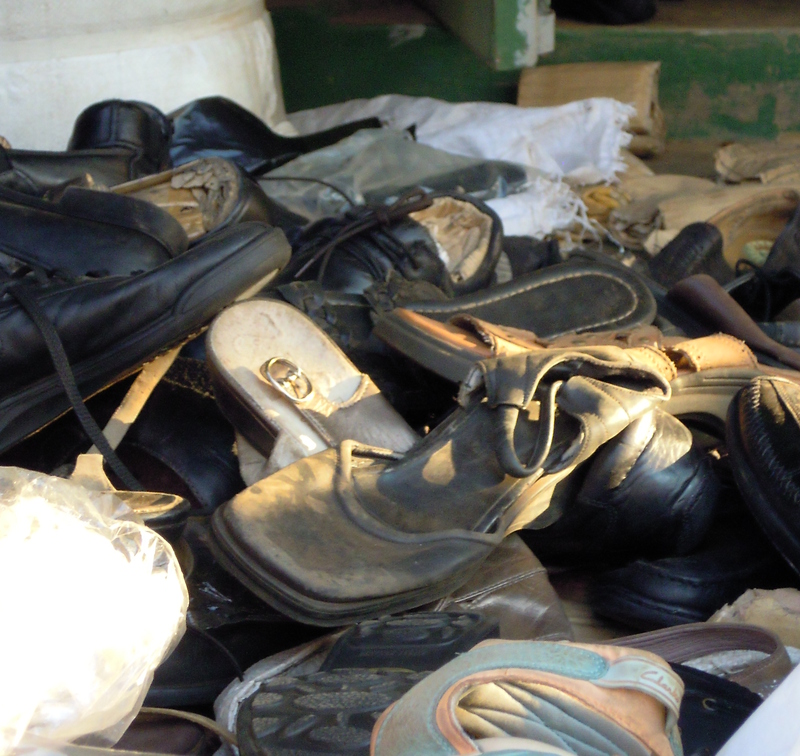 The shoes are in a big piles that you dig around in until you find one that might work. The shoe market is kinda funny as well because many of the shoes are obviously colorful shoes they have made black via shoe polish. This also means your hands get really dirty when you are looking through the pile. I am happy to say that of the 13 shoes we selected, only 2 needed to be exchanged for another size! The best part of the job though, is delivering all the supplies to the kids and seeing how happy they are that they will have everything they need to be successful in school. The smiles and thanks that we received from the kids was amazing and at the end of the day it makes it all worth it. The kids we work with are amazing children and everyday we are grateful to be a part of their lives and their journey.